Matthew Dalton of The Wall Street Journal reports that luxury fashion houses that have long relied on animal skins are shaking up their supply chains and seeking alternatives. Two of the world's biggest and flashiest labels, Versace and Gucci swore off fur this year joining the furless pack that incldues Armani, Ralph Lauren, Michael Kors, Hugo Boss and London Fashion House Stella McCartney. PETA is keeping up the pressure on Hermes. Eric Story and Alison Smith dreamed of combining their 30 years of retail experience and wine knowledge to start their own winery. The two were accomplished and eager, but short on cash. “We didn’t have an inheritance,” Smith says. What they did have was an 80-pound Goldendoodle. Pledging to put “farmers first,” Smith and Story turned to Kickstarter, the world’s largest online funding platform, to raise the required capital in 2014. It worked. Within 30 days, the two had collected $25,000 in donations. “We are the first winery we know of to be crowd funded!” Smith says. What was interesting, aside from the generosity of the public, was that most of the supporters were followers of an Instagram account that Smith and Story had created for their Goldendoodle, Lord Sandwich. And most of them were asking when Lord Sandwich would have his own wine. At first, Smith and Story were concerned about putting Lord Sandwich on the label. “No critter wines for us,” says Story. With 65,000 followers on Instagram, however, the two decided that a market of that size with such devotion could not be ignored. The response was Lord Sandwich Red Table Wine, an extraordinary blend of zinfandel, syrah, pinot noir, carignane, grenache and petite sirah. The wine is a dark reddish-purple in the glass and presents aromas and flavors of blackberry, pepper and spices. Rich and complex, the wine is also smooth and very approachable for an everyday dinner or special occasion. Smith Story Wines are made with respect for the land and, as promised, respect and support for the farmers. All of the vineyards where Smith and Story source the winery’s grapes are owned by small-scale, family farmers. The Smith Story winemaking philosophy is to utilize classic Old World techniques and to let the grapes and the sense of place where they are grown speak for themselves. With a plan to share their good fortune with those in need, Smith started a nonprofit, Socks for Sandwich, in November of 2014, combining Lord Sandwich’s passion for socks with a charitable purpose. For every bottle of Lord Sandwich sold, a new pair of socks is given to someone in need. With the release of 601 cases of the first vintage of the wine that bears Lord Sandwich’s name, the charity gave out 7,212 pairs of socks. Some of the recipients of new socks include organizations devoted to women and children recovering from domestic abuse, children in foster care, homeless individuals, victims of weatherrelated catastrophes in the U.S., farm workers, and county and city service organizations devoted to assisting those with challenges. “He has a special way of making anyone smile and inspires hundreds each day with his playful spirit and giving heart,” says Smith of the nonprofit’s namesake. Checks and donations of new socks can be sent to Socks for Sandwich at 1415 Fulton Road, #205-224, Santa Rosa, CA, 95403. Credit card donations can be made at socksforsandwich.org. Follow the life, times and charitable work of Lord Sandwich on Instagram @sandwichthedoodle. Gina Trippi is the co-owner of Metro Wines at 169 Charlotte Street in Asheville. Committed to the community, Metro Wines offers big shop selection with small shop service. Gina can be reached atgina@metrowinesasheville.com or 828.575.9525. Story was reported in The Asheville Citizen Times today, March 24th. HERE. Brother Wolf has issued a reward for evidence leading to capture of the perpetrator and MetroWines has sent this Letter to the Editor. How many more stories (March 24th) do we need to read like "Dogs found dumped, dead of gunshot wounds?" Animal abuse is not an insignificant crime. Acts of cruelty are collected along with felonies including arson, burglary and homicide in the FBI database. the prosecutor should seek the strongest penalty and, upon conviction, the court should so decree. and businesses should know the identity and the whereabouts of these criminals. Because, studies show, they will go further. They will do more. Calling on friends to help stop the abuse. Your Shop Dog, Bandit. "For most Americans, dogs are no longer relegated to the doghouse. According to the American Pet Products Association, an industry trade group, almost 60 percent of dog owners say they regard their pet as a child or member of the family. And many let their dogs snuggle up to sleep right in their human owners’ beds, often alongside their owners." Great story. Boy, what I would give for one more day of sleeping next to Cate. Miss you, my friend. 45% of Millenials say getting their pet's approval of their dates would matter more than getting family approval, according to a Zulily survey. Well, of course. Tell it like it is! And Parade Magazine answers what pets give back. "Science has proven dogs have the power to turn your frown into a smile. When you pet a dog, your body produces oxytocin and endorphins, hormones that lift your mood and strengthen the emotional bond between you and the dog. Oxytocin is the homrone that binds a mother to a child and one lover to another. Simply watching dogs playing or goofing around helps people feel happier and more relaxed." That's my Cate. Got to make you smile. She was so beautiful. Sir Paul McCartney, while he continues to sell out concert venue at 75, is leading the Meat Free Monday Campaign asking people to skip meat just once a week to "help slow climate change, preserve natural resources, and improve their health." David Dunlap writes for New York Times about Edith Wharton's battle with the president of the ASPCA. Power to the people! OK, I said that part. With love, Your Shop Dog, Bandit. Times Insider shares historic insights from The New York Times. In this piece, David W. Dunlap, a metro reporter, looks back at a particularly memorable letter sent to The Times’s publisher. But she hated John P. Haines, the president of the American Society for the Prevention of Cruelty to Animals. 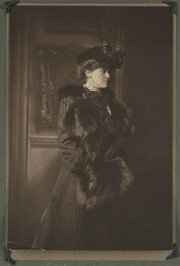 Mrs. Wharton and other members of the society believed that Mr. Haines was at least inept, if not corrupt, in his management of the agency. After an especially stormy meeting on Feb. 15, 1906 — a meeting so chargedthat it was front-page news in The New York Times — Mrs. Wharton took pen in hand at her townhouse on Park Avenue and East 78th Street. “As one of the S.P.C.A. members who are trying to put the Society on a better basis by an honest investigation of its methods, I write to ask if, in speaking of yesterday’s meeting editorially, you will bring out as forcibly as possible that the two motions carried yesterday by Mr. Haines & his friends have resulted in cutting off all investigations and silencing the members for one year. “The best service that can be done by the Press to those desirous of reforming the S.P.C.A. is to lay emphasis on these facts, & also on the fact that Mr. Haines voted for both motions, & that at least four of those voting with him (by his own admission) were employés of the Society. “Irrespective of personal sympathies, we want the public to know that the members have been gagged. What brings her to mind this week is the fire on Sunday that consumed the chapel near Madison Square Park in Manhattan where she and Edward Wharton were married in 1885. Both Whartons were devoted to animals; she to dogs and horses, he to cows, sheep, ducks and hens. “Dogs — small dogs and preferably Pekinese — were among the main joys of her being, and had been since she was a child,” R. W. B. Lewis wrote in “Edith Wharton: A Biography” (1975). 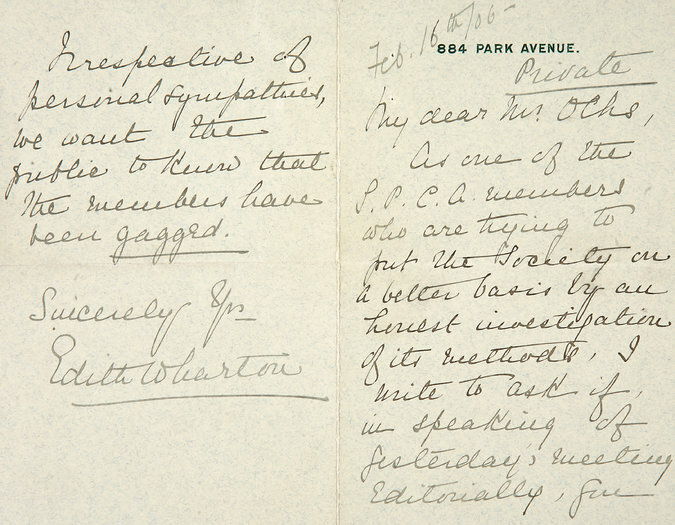 The meeting in which John P. Haines was “hotly assailed,” which Edith Wharton attended, inspired her to write a personal note to the publisher of The Times. Of course, The Times offered balance in its account, noting that Mr. Haines enjoyed the support of Miss Irwin Martin, the vice president of the Toy Spaniel Club. “She wanted to vote that no further evil reports of the management be listened to,” The Times said. In the end, the reformers won. Mr. Haines resigned on March 8. Nine days later, the Whartons sailed for Europe. I miss you Cate. Every minute. Of every day. Your Bandit. Whitney Cummings "hung out with wolves"
Comedian Whitney Cummings tells her story on "I Hung Out With Wolves" in NYT. "Some wolves were not raised with other wolves, so they never learned certain behaviors, and some that looked less like them were raised with wolves and hence more wolflike. Hang out with a wolf, and you’ll become more like one." Around here in Asheville, we support Full Moon Farm Wolfdog Sanctuary HERE! That's AmbassaDog "River" in the picture above. Bandit here reporting this disheartening although, sadly, not surprising, news concerning Wayne Pacelle. Robot Dogs are for Robots. So many dogs need a home. If you can, please do. Riley is trained to detect moths and other pets that could dmaage high value artwork at the Museum of Fine Arts in Boston. Parade Magazine reports that your fountain of youth was fueld in part by your commitment to animal welfare. Thank you for being there. And Happy 96th Birthday from your fans @MetroWines! 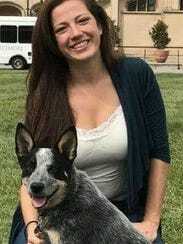 Kara Pollard, 33, is executive director of Dog is My Co-Pilot, an animal rescue operation in Jackson Wyoming. Dog Is My CoPilot is a catchy name, but what does your outfit do? We fly animals — 80 percent dogs and 20 percent cats — from about 20 source shelters, where they are in danger of being euthanized because of lack of space, to some 62 receiving animal rescue organizations where these animals are more likely to be adopted. According to the A.S.P.C.A., approximately 1.5 million shelter animals are euthanized each year. We work with groups in 15 American states from Louisiana west. WOW. What a story. Thank you Kara. I need a smile. I got one. Wall street Journal suggests that you write an OBIT for your passed friend. Link to story, which may or may not work if you do not subscribe is here. Almost 3,000 dog obituaries are posted on the website Doggy Heaven along with 20,000 photos and comments, said Steve Cencula, who created the site... Doggy Heaven allows visitors to post digital icons unde the pet's anme, including chew toys, steaks, baco and dog bones. For Cate, if I could, I would post her beautiful turquoise collar and coat from The Sunburst Project operated by The Greyhound Alliance in Chicago to honor her courage and other greyhounds whose racing careers have ended making them of little value to the racing industry. Me and Cate, and since 2011 6,000 other greyhounds, have found HOME through The Sunburst Project. Until racing ends, there are a LOT of us out there. Help The Greyhond Alliance Sunburst project if you can. This link works and you can see my family listed: RIGHT HERE! You support a free press? The First Amendment? READ ABOUT THE TRAVESTY AND WHAT THE ANIMAL LEGAL DEFENSE FUND IS DOING ABOUT IT HERE.